Members of the Summit High School class of 1988 add items to a time capsule scheduled to finally be opened next week. The Frisco Historic Park will continue it’s 35th anniversary celebrations next week with the long-awaited opening of a time capsule buried by the Summit High School class of 1988. 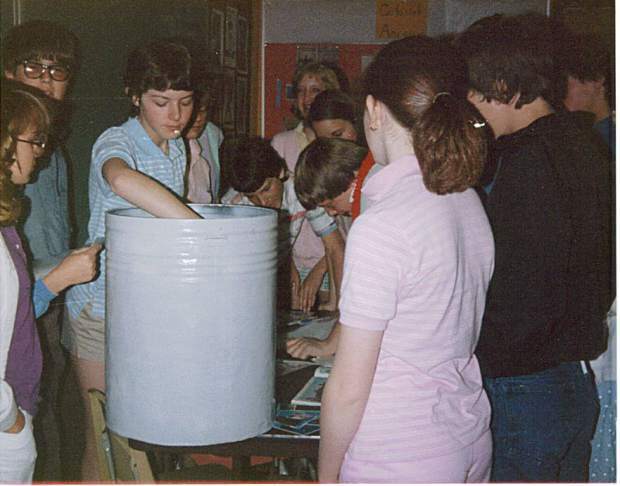 The capsule was buried around this time of year in 1984, while the class was in just eighth grade, with the promise of opening it 30 years after they graduated from high school. Many members of the class of ’88, retired teachers Jon Kreamelmeyer and Kathy Wester, and former Summit Middle School principal Don Loptien will all be present when the time capsule is opened. The class of 1988 was the first to attend formal preschool in Summit County in 1974, sharing a classroom with the kindergarten class where the Summit Middle School now stands. Five of those preschoolers attended class together all the way through graduation. The opening will kick off a weekend of 30-year reunion activities for class members. The town of Frisco will be burying a new time capsule at the same location, and is encouraging citizens to bring items to commemorate the spirit of the year 2018 in Frisco on Oct. 10. Items must be small enough to fit into a container the size of a five-gallon bucket. The new time capsule will also be opened in 30 years. The opening of the time capsule will take place at 2:30 p.m. on Oct. 12 at the Frisco Historic Park.